Coachella Estate Planning Attorney Sheila Barton assists clients in creating sensible estate plans and making arrangements for the future. Call our firm for knowledgeable and compassionate legal counsel regarding trust administration, durable powers of attorney, wills, probate litigation, trusts, and various other estate planning tools. Ms. Barton works to find the estate planning methods that fit each client in Coachella, Riverside County, or anywhere else in California. 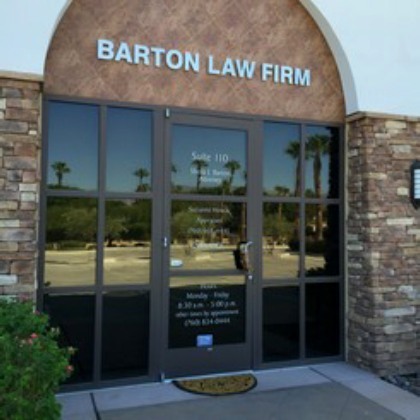 Coachella Estate Planning Lawyer Barton has over 30 years of experience. She carefully crafts estate planning documents in order to accurately represent and accomplish client wishes. Ms. Barton understands how best to maximize accumulated assets, minimize tax liabilities, and decrease the chances of future litigation issues. Coachella Attorney Sheila Barton helps individuals make practical choices in estate planning matters. If you have questions about how to efficiently transfer assets to family or if your concern is about any other estate planning need, call our firm. Ms. Barton offers insightful direction on many estate planning issues. When the time comes that an individual is no longer able to make their own medical decisions, an advance health care directive will allow a trusted agent to do this for them. Coachella Estate Planning Attorney Sheila Barton can draft effective advance health care directives that provide peace of mind to the family now and in the future. When a member of the family passes away, others could become overburdened with the complex estate matters and probate issues that often arise. Coachella Probate Lawyer Barton is able to create effective strategies for avoiding or resolving such matters, including those involving appraisals, probate document preparation, asset liquidation, heir notification, and more. Coachella Estate Planning Lawyer Barton provides compassionate and individualized assistance in creating estate plans that minimize tax liabilities, safeguard wealth, and reduce the chances of litigation. Our estate planning and probate law firm can help enforce your wishes in the event of death, incapacitation, or other circumstances. Attorney Barton can help you gain better peace of mind regarding future medical and financial matters. Coachella Attorney Barton is also a reliable employment attorney. Call our firm if you are involved in an employee vs. employer dispute.